Aflatoxin is a hazardous toxin produced by fungi that grow on a wide variety of crops, including staples like maize and groundnuts. Consuming aflatoxin-contaminated food can result in impaired nutrient absorption, organ failure, cancer, and—in children—stunting. In addition, aflatoxin can lead to economic losses when farmers are unable to sell or trade contaminated crops. 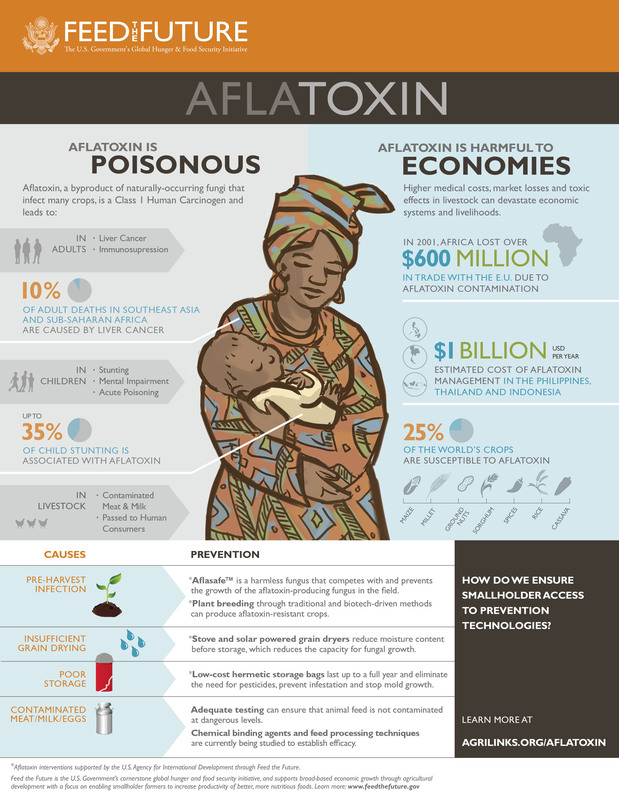 Because of these detrimental health and economic impacts, aflatoxin is undercutting progress in international development and global health. Thankfully, harmful aflatoxin exposure can be prevented, with a suite of technologies ranging from contamination control to detection. Feed the Future and its implementing partners recognize the urgent need to put these aflatoxin prevention and mitigation technologies into the hands of farmers in the developing world. By supporting aflatoxin research, technology distribution, farmer training, and key policy and community discussions, Feed the Future is aiming to reduce the burden of this invisible but pervasive toxin. With increased global attention and partnership focused on aflatoxin control, we believe that rapid progress can be made.